MISS PEREGRINES HOME FOR PECULIAR CHILDREN BY RANSOM RIGGS REVIEW! Summery : A mysterious island. Halloween happened almost a week ago, so that means that the Halloween read-along is officially over! What’s even sadder is the fact that October is now officially over! Onwards and upwards to Christmas though! For our 2015 Halloween read-along we decided that Miss Peregrines Home for Peculiar Children would be quite fitting. 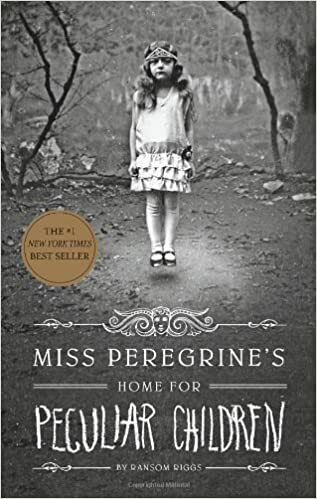 Miss Peregrines Home for Peculiar Children by Ransom Riggs follows Jacob as he travels half way around the world to figure out his grandfather’s mysterious childhood. He comes across the Peculiars, a set of child who he only believed to be a fragment of his grandfather’s imagination. The story unfolds with a lot of plot twists as it continues. First of all, this book was highly enjoyable. The amount of thought gone in to the plot and range of characters could be appreciated by anyone. You got sheer pleasure from learning about each different Peculiar and their different ability. It was easy to imagine them as Riggs did an incredible job with the writing. It was said numerous times in the daily updates that we simply couldn’t believe that this was Riggs’ first novel. One of the best aspects of Miss Peregrines is the interesting, and often unexpected, twists and turns, which were written so well! Many points in the book were a slight shock as you learn various things about each event or each character. Usually, small clues were scattered throughout the book before a twist which is even better because it makes you think back and realise how strange a certain situation was or why someone acted the way that they did. The one thing that was captivating about this novel were the photos that were included every so often in the story. Without them it might have been a little harder to follow and might be a little bit of a heavy read. They broke it up nicely and really got you to visualise the type of place where Jacob was and the people he was interacting with. The characters themselves were complex and intricately detailed. Each one had a different and memorable personality which is always exciting as you can’t wait to interact with them all again when they appear throughout. They have very different perspectives compared to Jacob which is a really interesting change considering we follow him and his thoughts and views through the novel. Also, now Sophie has finished the book, she looked up the casting for the film (which has been avoided until now) and has some mixed feelings but there are some brilliant actors who she’s completely confident will play the parts amazingly and bring their own quirks to their characters. With Tim Burton as director, she’s sure he will make this visually stunning and personally hoping quite a bit creepier than the book! We would definitely recommend this book to anyone who’s interested in novels with extreme plots twists to it! However if you’re looking for something to keep you wide awake at night and checking your doors are locked, i’d go for something a little different!